Meet Jacksonville Beach's Volleyball coach's. These are north florida's elite beach volleyball coaching staff. You will learn to play volleyball like professionals. Pass, bump, spike, serve better than you ever used to with these coaches. Jax Beach Volleyball is proud to introduce a staff that is second to none. Coaches at JBVB posses a knowledge and understanding of beach volleyball in a way that can be easily understood and implemented. All coaches are put through training by JBVB's director to ensure consistency and excellence while on the volleyball court. Kent can recall passing the volleyball with his dad on the beach when he was about 8 years old. It started out simply, they couldn’t stop passing the ball back and fourth until they got to 10 consecutive passes. It soon went to 20, then 50, then 100 before the game became no longer stimulating. When Kent was 13, he received a phone call from a family that is known for their stature in the beach volleyball world. Karen VanZwieten had found Kent’s contact information after seeing and meeting him one time on the beach while playing beach volleyball to invite him to play in a beach volleyball tournament with her youngest son, Mark VanZwieten (10 years old), in a 16 year old and under regional qualifying tournament in Jacksonville Beach! The prize for winning was an all expense paid trip to Manhattan Beach, California to play 16U National Tournament. Wouldn’t you know it?! They won!!! It was at precisely this moment that Kent realized volleyball could literally take him places. From there, Kent partnered up with Mark’s older brother, Steve, and represented USA in the first ever Junior Olympics (18 and under) in Sydney Australia in 2000. Kent and Steve placed 4th out of 16 teams from around the world. They finished above the other American team, so USAV sent the duo to Le Lavandou, France in 2001 to compete in the first ever Junior FIVB (20 and under) where they placed fifth out of 25 teams. At UNF, Kent was a Student Assistant for the Lady Ospreys all four years. His college internship was completed at Jacksonville Indoor sports where he held the title of Volleyball director in 2005. This is where Kent began his start with coaching private lessons. JJVA appointed Kent the Director of Beach Volleyball in 2008 where he stayed until 2012. In 2013-2015, he was hired by Powers Volleyball Club with the same title. Creating Jax Beach Vb was the culmination of all prior experiences and logical next step for Kent in 2016. Kent Ammons was born and raised in Fort Lauderdale, Florida. Kent grew up being a kid that plays all kinds of sports from baseball and basketball to surfing and ping pong. After graduating from Northeast High School, he moved to Jacksonville, Florida to continue his education at the University of North Florida. In 2006, he graduated with a BA in Physical Education with a focus in Sports Leadership (coaching & managing sports teams). Soon after Kent graduated, he decided to pursue a career as a firefighter. Kent was hired as a firefighter/paramedic with Clay County Fire Rescue in 2009 and has been there since. Kent has one half sister, Kelly, who is married with a witty son and two beautiful daughters. Peter grew up in Southern California where he learned to play volleyball and basketball at a very young age. He played club volleyball for Seal Beach in California and played in the Junior Olympics at age 13 before moving to Florida. When he moved to Florida he focused on playing basketball and earned a full ride to The University of West Florida in Pensacola, Florida where he was a four year starter and ranks 8th all-time in both assists and steals. Peter played college basketball at The University of West Florida where he earned a degree in Athletic Training. He now practices as a Licensed Athletic Trainer at the University of North Florida in Jacksonville, Florida. Prior to moving to Jacksonville, Peter coached boys and girls volleyball and boys basketball at the Varsity high school level for 3 years as well as one year coaching club at OTVA. Since graduation, he has fallen back in love with volleyball and wants to help grow the love of the game for young athletes. He currently has two Open level wins and has a finish on the NVL tour of 13th. Tanner played collegiate volleyball all four years of her undergraduate studies. Two years at Webber International University (NAIA), and two years at The University of North Florida (NCAA Division I). At age 15 she played club for Inland Volleyball Club, and started competing in juniors’ beach volleyball tournaments over the summer. She then went on to play at Timber Creek High School, where her team won the State Championship in 2008. At Webber International University (NAIA), she competed in the top three pairs of the beach team, and was the starting libero for the indoor team. In 2012, she was named the Lady Warriors Defensive Player of the Year and was awarded The Sun Conference Second Team All Conference, with a total 465 digs, averaging 4.7 digs/set, finishing second in the conference. She later graduated in 2013 with an Associate of Science degree in Sport Business Management. She then transferred to UNF (Division I), where she competed on the Sand Volleyball team. On their way to finishing the season as the A-Sun conference regular season champions, in 2013, she was partnered with Cameron McGuire at the number three seed. They earned the honor of the winningest duo of the team. The Ospreys were the Atlantic Sun in-season Conference Champions in 2013 and 2014. Tanner graduated with honors in the summer of 2015. Earning a Bachelor of Science degree in Communication with a concentration in Advertising. She has several years of coaching experience through UNF, WIU, IVC, TCHS & PVC. Brandi played indoor Collegiate Volleyball for Lebanon Valley College (Division III) from 2005-2009. She was and Outside Hitter for two years and Libero for two years, thus giving her extensive knowledge in both positions. Brandi also has experience coaching juniors from coaching for Herd Volleyball Club in 2008 and for Baker County Juniors in 2001. Brandi moved to Jacksonville from Pennsylvania in 2009 and started competing in high level, open beach tournaments along the coast. Dylan learned the game of volleyball on the beaches of Naples, FL. After being coached for several years by former beach professionals, Nick and Chris Sweat, Dylan decided that he wanted to get into coaching. 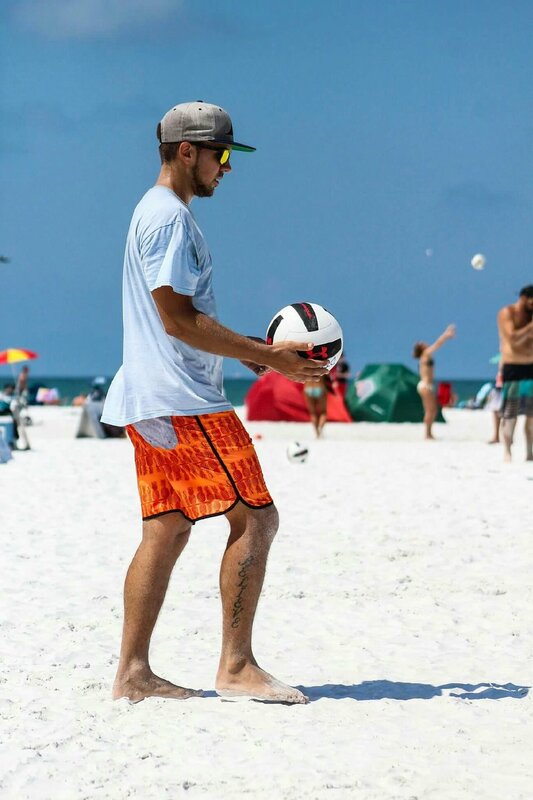 Dylan moved to Orlando in 2012 and coached indoor and beach at Top Select Volleyball Academy, where he helped two teams qualify for the USAV National Championships. Dylan also coached one season at Lake Nona High School, where his team finished with a school record of 28 wins and a fifth place finish in the state tournament. Dylan moved back home to Naples in 2015 and coached the inaugural season at VIBE Volleyball Academy with Florida High Performance coaches, Dave and Janett Benoit. Dylan is currently the volunteer assistant coach for the beach volleyball team at Jacksonville University (Division I).